At this time we are NOT looking for animal fosters. If you are interested in helping displaced families by fostering pets please click the link below. You will be directed to the "Camp Fire Foster Animal Connection" Facebook group that will allow to connect with those in need of fostering. Foster care volunteers provide temporary care for kittens, puppies, dogs, and cats. Some animals may only need a home for several days, while others may need several months of care. By offering your time, energy, and home to an animal in need, you prepare an animal for adoption into a permanent home and prevent overcrowding in our shelter. We are particularly in need of foster homes to help feed orphaned kittens. 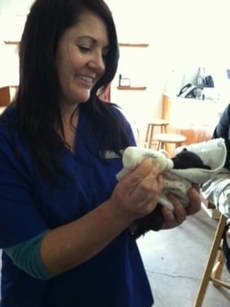 This is a challenging but very rewarding job, and spring brings many orphaned kittens to the shelter. How to sign up: Follow the link below to fill out our Foster Application. Wait to be contacted by the Foster Coordinator to see what kind of fostering is currently needed at Chico Animal Shelter. If you are unable to sign up online, you can pick up an application in the front office of Chico Animal shelter. Please feel free to contact the Volunteer Coordinator if you have any questions or issues signing up via e-mail at hannah.booth@chicoca.gov or by calling Chico Animal Shelter during normal business hours. Click here to fill out the foster application!